Automata Formula by George Coleman sounds like a good ol’ millionaire dream – making huge profits without having to do anything at all? Who wouldn’t want that? Of course, it’s almost a given that Automata Formula is a scam, but how does it work? 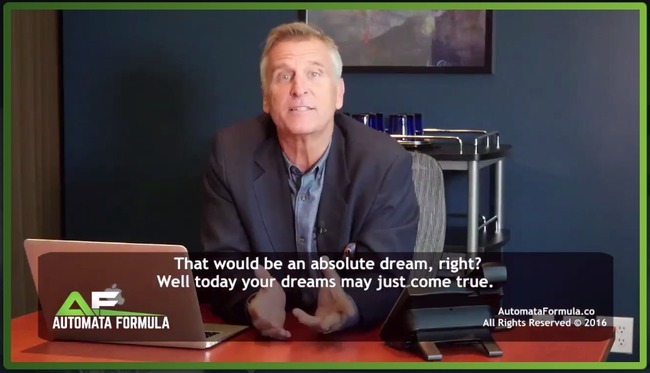 In this Automata Formula review, I’ll reveal why the software isn’t what George describes it to be, how it makes money from you, and the real way to making money online. I’ve seen the same trick again and again – some scammers promise to help inexperienced internet users make money online, only to take their money and disappear without a trace. This is the way online scams work, and it’s so rampant partly because the victims have no way of catching the culprits. Unfortunately, there is no way to get a refund on the losses. The victims can only withdraw what’s remaining in their trading account, which is typically just a fraction of their initial deposit. What is Automata Formula All About? 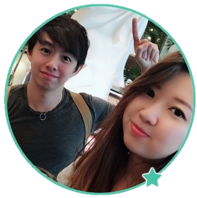 Automata Formula is a generic binary trading software that is designed to trade binary options on your behalf, which is a risky trading instrument that works like gambling. When you register for an account on Automata Formula website, you are actually signing up for an unregulated broker account which affiliated with the scam. You’ll need to fund at least $250 to start trading. However, George emphasizes that it’s not a payment in order to lure you into the scam. Once you activate Automata Formula, it starts to generate random trades on your behalf. Victims typically lose all their deposits within hours of activating the software. These losses are pocketed by the broker, which is then shared with the scammers behind Automata Formula software. Even though it doesn’t cost you anything to use the software, the scammers make money from their victims through the trading deposits. 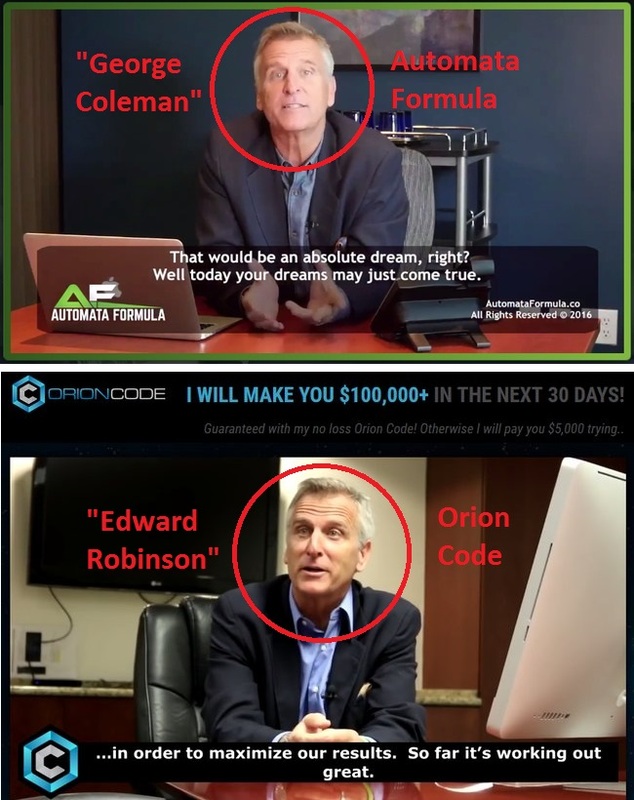 As reliable as he seems, “George Coleman”, the alleged founder of Automata Formula software is actually a seasoned actor when it comes to binary software scams. He has been featured in multiple other scams, including ones that I have reviewed recently such as Orion Code and The Amissio Formula. Similarly, these scams promised to make easy profits for their users, just to siphon their trading funds away via a series of losing trades. I believe we’ll see more of the same actor in upcoming scams, so look out for him if you happen to come across more millionaire software. There is simply no push-button software when it comes to making money online, no matter how the scammers want to sugarcoat it. You need to forget all these empty promises and learn how to build an online business if you are really dedicated to make a living from the internet. In the sales video, we can see a few video testimonials from the “members” of Automata Formula. These members seem to have made good money using the software and transformed their financial lives. Now that we know the founder of the software is fabricated, what’s stopping them from hiring more actors to confuse their victims? And that’s exactly what they did. 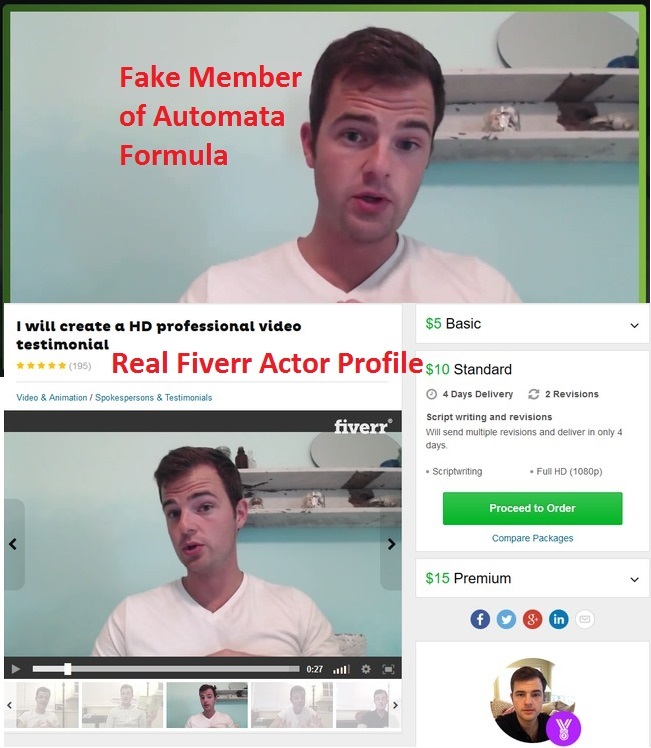 These video testimonials can be bought for as low as $5 from Fiverr.com. These are freelance actors, and you can even buy one if you wanted. All you need to do is to provide them a script and they’ll say whatever you want. I do not condone or condemn the act of buying and selling fake testimonials, but I want you to be aware of this – that fake testimonials can be bought very easily. As much as the scammers want to keep you in the dark, they have to reveal the true nature of the scam somewhere in the website to avoid lawsuits. Much like the hidden terms and conditions of some hideous products, Automata Formula is hiding the truth behind the risk disclaimer above. The terms cannot be found anywhere in the sales material, because it is supposed to be hidden from you. However, you can access their original disclaimer at this link automataformula.co/terms to make sure the screenshot above is authentic. Despite coercing you to sign up for the “free” money-making software, Automata Formula denies inviting you to trade binary options. Note: Frauds that promise unrealistic returns like Automata Formula are illegal in many jurisdiction. If they do not include this clause, they are deemed to illegally coerce you into signing up for the scam. Automata Formula admits that trading binary options is extremely risky, and it’s your own responsibility if you decide to sign up and lose all your investments. NO REAL TRADES HAVE BEEN EXECUTED using the software. All profits quoted in the sales material are fake. AUTOMATA FORMULA IS A SCAM. I strongly advise you to stay away from the scam if you don’t want to lose your hard-earned money.